With the start of summer and hot temperatures, everyone always thinks of shade. Trees have been going through some tough times with the continuing drought and this summer will be no different. Proper watering of established trees is essential if they are going to survive another dry, hot summer. Even if there are water restrictions in your area, you can help your trees out with mindful watering. One of the first signs of lack of water is a dry / burned area around the outer edge of the leaf. This is called marginal leaf burn and should not be ignored. It indicates that the tree needs more water. If you find this type of damage, don’t just turn the hose on for a day. If you have a sprinkler system double check the heads around the tree. Add more heads if needed or redirect the heads you have. For those who water by hand, watering in the morning is preferred over evening watering. The other side of this stress is too much water. Water logged soil displaces oxygen around the root system and the tree will slowly drown. 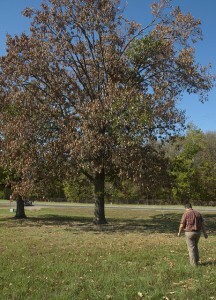 When trees are stressed they are more susceptible to insects and disease damage. The bottom line is to keep the tree properly watered. This entry was posted on Tuesday, June 14th, 2016 at 8:31 am	and is filed under News & Updates. You can follow any responses to this entry through the RSS 2.0 feed. Both comments and pings are currently closed.